A mid life crisis for most people is a time when they do things that are considered to be out of the ordinary. It’s a time when men and women realise that they’ve lived half their life and want to spend time getting the most out of it before they die. Perhaps this slot game from Real Time Gaming is one of the ways you’ll want to spend your Mid Life Crisis. The overall design of this online pokie isn’t specifically something that could be called inviting. It looks quite dated when you compare it to many other offerings. RTG also hasn’t really incorporated anything exceptional in terms of graphics for you to enjoy either, which is a bit of a let down on the whole. Mid Life Crisis brings forth a standard slot layout of five reels and three rows in total. It’s quite a flattened layout when you compare it to other online slots. Alongside this design, there are nine different pay lines for you to bet on, and you can also customise these to suit your own preferences. Bets can be adjusted in a couple of different ways too. The coin value in the game is set at $0.25, so if you choose to alter the active amount of pay lines, you can place bets between $0.25 and $2.25. Then, you also have the ability to change the amount of coins in action per line between one and five. This means that the maximum overall wager possibility stands at $11.25 per spin. Visually speaking, the game is decent, although nothing ultimately special. It hasn’t had overwhelmingly great graphics added to it, which does prove to be somewhat of a downfall for us. Pick Your Poison Bonus Game: There is a symbol of a woman in this game, which works as one of its scatter symbols. Whenever three of these appear on reels one, three and five at the same time, this round activates. This provides a screen with various “youth potions” on it. You need to choose from these to reveal prizes behind them. If you open the wrong bottle though, you’ll end the bonus round where you stand. Mid Life Man Bonus Game: The second scatter symbol of this game is of the man with a toupee on his head. Three of them showing up anywhere on reels two, three and four will activate the Mid Life Man round. This gives you the chance to win up to 350 coins. Progressive Jackpot: You’ll get to see the value of the jackpot increasing as you play and to be able to win this, it all comes down to the flashy red sports car icon. You’ll only be in with a chance of winning the progressive amount if you are playing with the maximum bet. To win the progressive, you just need to line up five of the red sports car on a winning pay line! 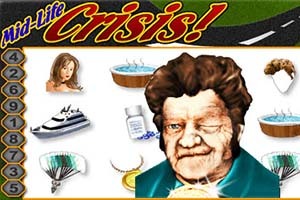 The game’s theme is nicely incorporated into its reels, with various mid life crisis symbols being visible. These include a wad of money, a motorbike, a parachute, a steaming hot tub and a gold medallion chain. One thing that may come as a bit of a shock is that the slot doesn’t come with any form of wild icons for you to benefit from though. While the idea and theme behind this game is great, it suffers from poor execution and lacking graphics. It’s great to see a progressive jackpot is available within the game, but between this and the bonus rounds, it’s not enough to make it a completely thrilling slot to play. You can read more pokies reviews here.